Above Your Space was established in 2006 to accommodate the needs of small to medium size businesses by providing upmarket boutique lock up offices. The website has been transformed utilising the WordPress platform and showcases both the Bonnington and Billens locations. Current tenants are able to login to the website to view availability and then make direct meeting room bookings from anywhere, 24/7. The team at Limelight redeveloped our old website into something that brought us into the modern world. 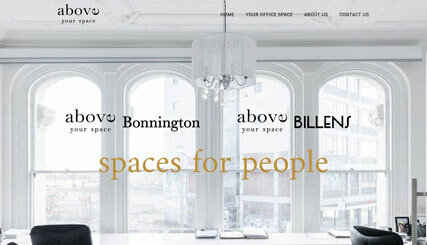 It can be seen on all devices and showcases our boutique offices magnificently. Suzanne and the team at Limelight were fantastic to work with and made everything very easy from start to finish. The support team is very dependable and respond immediately if you have any issues.